With colorful visuals and gameplay that's both fun and clever, Guacamelee is the latest indie platformer that gamers should definitely look into. There’s no doubt that the 2D platformer has seen a major resurgence in recent years. Not only have there been big console releases like Rayman Origins and the New Super Mario Bros. games, but indie developers have also warmed up to the genre and released such titles as Super Meat Boy, Battleblock Theater, and Fez. One such title was last year’s Dust: An Elysian Tail, which chose to present its world in a style commonly referred to by gamers as “Metroidvania”. This is a reference to the two series that popularized this approach, those being Metroid and the sidescrolling Castlevania games, post-Symphony of the Night. The idea here is that instead of going through a linear set of levels, the player progresses through one large interconnected world with plenty of alternate paths and secrets to find. The catch is that many of these diversions are initially inaccessible, and the player must first earn certain items or abilities to access them and further progress. Dust was a quality title, but a notable downside for some was that it was an Xbox 360 exclusive. As was Shadow Complex, an earlier title in a similar mold. 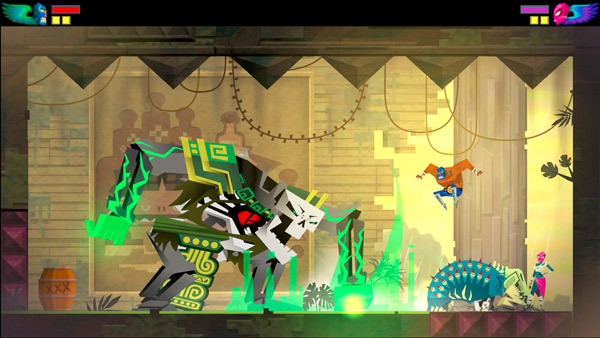 Now, PlayStation 3 and Vita owners are getting their own exclusive Metroidvania in the form of Guacamelee, a clever, colorful, inventive, and downright fun mashup of platforming and brawling that should not be missed. The story starts off in a Mexican village, and follows the adventures of Juan, a common man who dreamed of being a successful luchadore in his youth. When an undead skeleton by the name of Carlos Calaca kidnaps El Presidente’s Daughter and schemes to combine and rule over the alternate worlds of both the living and the dead, Juan is chosen by a mystical mask that grants him various luchadore powers, and sets out to make things right. The story is simple and not particularly involving, but it’s helped by the fact that the text-based dialog given to its colorful cast is quite well-written. Indeed, the game’s general presentation is quite gorgeous, with a stylized look that gives off an authentic Mexican vibe, complete with mariachi music and various elements on the side, such as your rewards after each battle being provided in a pinata for you to bust open. Fans of gaming will also spot plenty of humorous references to other titles of various subtlety. Off the top of my head, I remember seeing references to Mario, Wreck-It Ralph, Final Fantasy, and Strong Bad. More obvious ones include a store for you to visit called Viva Pinatas, and earning new powers from birdlike “Choozo” statues, a reference to the powerups in the Metroid series. Some who read this might expect a Family Guy-level of random pop culture references tossed in every minute, but it’s done in a way that doesn’t feel overbearing. The actual gameplay, while obviously having a heavy emphasis on platforming and exploration, also tosses in brawler elements. You can pull off various combos and spend your hard-earned cash from battles to further bolster Juan’s regiment of special moves. These include uppercuts and body slams to start things off, and the ability to grapple and throw enemies once some of their health has been drained. Sometimes, the combat can definitely get a bit frenetic and hard to follow, but the fact that you have unlimited lives and checkpoints are frequent makes up for that. Other, non-battle based mechanics include the delightfully random ability to turn into a chicken and make your way through smaller tunnels. A more important one is the ability to shift between the parallel worlds of the living and the dead. While you’ll initially start off being forced to swap at specific points thanks to various portals in the environment, you’ll eventually be able to change whenever you feel like it with a tap of the shoulder button. The developers take full advantage of this mechanic and use it to create some challenging and very enjoyable platforming segments, where you’ll be wall jumping, busting through cracked bricks, and switching between worlds in mid-jump, as certain platforms that are accessible in one world may not be in the other. 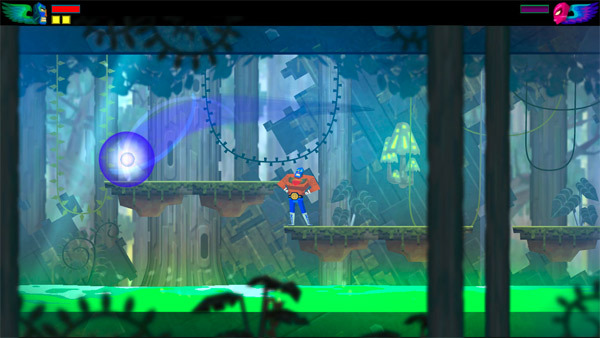 In what may be a genre first, there’s an entirely optional co-op mechanic, where a second player takes control of the spirit of the mask to help Juan out. This is certainly a big help during the more challenging battles, but it can make the platforming segments a bit trickier since players have to closely synchronize their movements at times. Also, there’s no online component to speak of, but as a neat bonus, players who don’t have a second controller can sync up a PS Vita as a substitute. 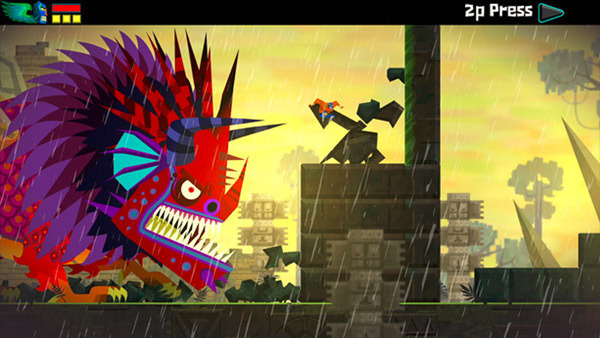 Guacamelee makes use of the Cross-Buy program, meaning that buying the PS3 version gets you the Vita version at no extra cost, and save files and trophies can be synced between both via cloud storage. I found no unique performance or gameplay issues on the Vita version, save for the awkward mechanic of swiping down on the screen to activate the chicken transformation, due to the lack of four shoulder buttons on the handheld. The save game syncing also doesn’t start you off at the precise location you’re at when you upload a save, but it’s still usually relatively close. Guacamelee is a real gem. Taking an already enjoyable genre and putting some unique twists on it such as world-switching and multiplayer, it makes for a fun, energetic gameplay experience. Fans of platformers and brawlers, and especially Metroidvania-styled games, should definitely spend some time with it.